Also, mark your calendars with October 11 and October 12. Soundstreams is celebrating 30 years of innovative programming and has asked NEXUS to be a part of it on Oct. 11 at Reich “Mallet Quartet” and presented its Koerner Hall premiere in 2010, and NEXUS will perform this “unashamedly optimistic and radiant work, full of the driving rhythms, catchy melodies and beautiful harmonies for which Reich is famous.” (www.ahbbs) It was a complete sell-out in 2010, so if you missed it then, don’t hesitate to buy your tickets by clicking here. The day after, on October 12th at 5 p.m. you have a rare opportunity to attend a FREE workshop/concert with NEXUS and Swiss drum set artist Fritz Hauser at Walter Hall, Edward Johnson Building, 80 Queens Park, Toronto. NEXUS has had a rich relationship with Fritz. They recorded “out of the blue” together (you can read more about “out of the blue” here), and Fritz joined us for the CD launch here in Toronto. (Listen to a section of it by clicking here and scrolling down.) 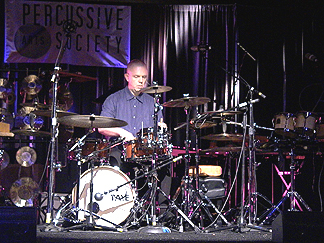 NEXUS and Fritz also performed together at PASIC 2004 in Nashville. 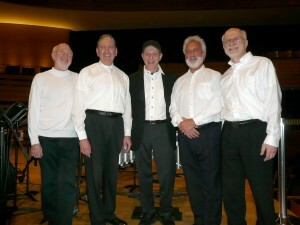 Fritz says, “Improvising with NEXUS is like having 10 extra arms and ears and being surrounded by about 150 years of musical experience …I heard NEXUS in concert and was blown away by the serene mastery of their performance.” Fritz always has fascinating projects on the go. Check out his website at www.fritzhauser.ch and join us at Walter Hall on October 12th, 5 p.m.